BANGI, 3 November 2014 – The use of the Malay language and Islam in science and mathematics can facilitate the understanding of scientific concepts better than in English. Professor Dr Shahrir Mohamed Zain said many of the principles of mathematics and science were produced by scientists who spoke Arabic. Prof Shahrir who was granted the title of Emeritus Professor at the 6th session of the 42nd Convocation of The National University of Malaysia (UKM) here today said Mathematics and the Islamisation of knowledge are among his passions, which he advocates strongly. Prof Shahrir is confident that students steeped in Islam through the Arabic language will find it easier to understand mathematics. He said in the past many Malays rejected mathematics as it was taught in the Western perspective, especially the English language. However, with the practice of teaching science and mathematics in Malay, the situation is changing. Although trained in the field of pure mathematics (quantum physics), Prof Shahrir is also actively championing Malay and Islamisation of Knowledge throughout his career. He is skilled in the fields of philosophy of Islamic science, ethnomathematics, languages and management theory, as well as his chosen field of mathematics, a sub-field of quantum physics. 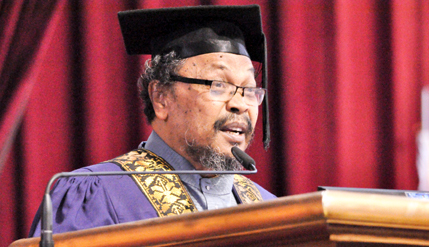 He is known to be rather outspoken and is a renowned academic and emerged as the first Malay to receive a PhD in mathematics. A graduate of La Trobe University in Australia (1967-1974), Prof. Shahrir obtained his PhD from the same university in the field of quantum mathematics. He encourages the teaching and learning in Malay at school level through to university and was among the chief proponents of using Malay in technical subjects at UKM till today. He served as Head of the Department of Mathematics in 1974. He was then promoted to Associate Professor in 1979 and Professor of Physics Mathematics in 1983. He was subsequently appointed Director of Qualitative Studies in 1984 and in 1991 assumed the position of Deputy Vice-Chancellor (Academics).